An A5 wedding menu booklet featuring the same playful butterfly image as the rest of the Flutterby range. Each menu personalised with your names, wedding date and venue on the front whilst your wedding breakfast details feature on the inside. A choice of three colours available, hand finished with diamantes. To place your order simply use the browse button below and upload your details. 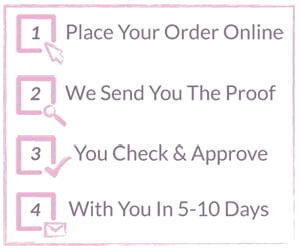 Your menu card will be created and a proof sent to you via email for you to check before proceeding to print.